Nicholas Hersh currently serves as Associate Conductor of the Baltimore Symphony Orchestra and Artistic Director of the Baltimore Symphony Youth Orchestras. 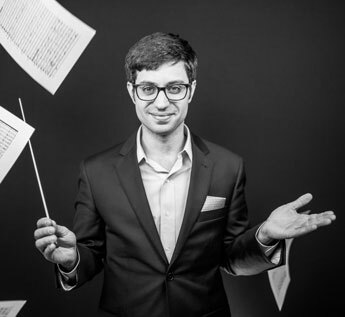 Since joining the BSO as Assistant Conductor in 2014, he continues to make his mark on the mid-Atlantic region with exciting, innovative programming—notably as conductor and co-curator of the acclaimed BSO Pulse series, bringing together Indie bands and orchestral musicians in unique collaborations. As Associate Conductor, Nicholas directs the BSO’s educational and family programming, including the celebrated Academy for adult amateur musicians, as well as a variety of classical and popular programs. After his successful Baltimore Symphony subscription debut, stepping in for an indisposed Yan Pascal Tortelier, Nicholas conducts the BSO in a set of subscription concerts each season. He has also appeared in concert with such orchestras as the New World Symphony, New Jersey Symphony, Auburn Symphony, National Repertory Orchestra, and the Southern Great Lakes Symphony. Nicholas is a frequent collaborator and guest faculty at the Peabody Conservatory as well as the BSO’s OrchKids program for Baltimore City schoolchildren. Nicholas grew up in Evanston, Illinois and started his musical training with the cello. He earned a Bachelor's Degree in Music from Stanford University and a Master’s Degree in Conducting from the Indiana University Jacobs School of Music, studying with David Effron and Arthur Fagen. In 2011 and 2012 he was a Conducting Fellow with the prestigious American Academy of Conducting at Aspen, studying with mentors Robert Spano, Hugh Wolff and Larry Rachleff, and has participated in masterclasses with Bernard Haitink and Michael Tilson Thomas. Nicholas is also a two-time recipient of the Solti Foundation Career Assistance Award. Nicholas also continues to earn acclaim for his skill as an arranger and orchestrator: he has had frequent arrangement commissions from the Baltimore Symphony as well as from the Cleveland Pops, the National Repertory Orchestra and the Jackson Symphony. His orchestral arrangement of Queen’s famous Bohemian Rhapsody saw worldwide success after the video of its premiere and subsequent studio recording went viral on the Internet.